The weather is definitely changing, even here in Southern California. I’m craving hot herbal tea, which I haven’t made in forever, and soups. I made this roast vegetable soup last night. It was perfect for lazy cooking on a chilly day. Most of the work is done by a hot oven and time. High heat converts the starches in the vegetables to sugar and the browning in the oven adds a complexity to the overall flavor. 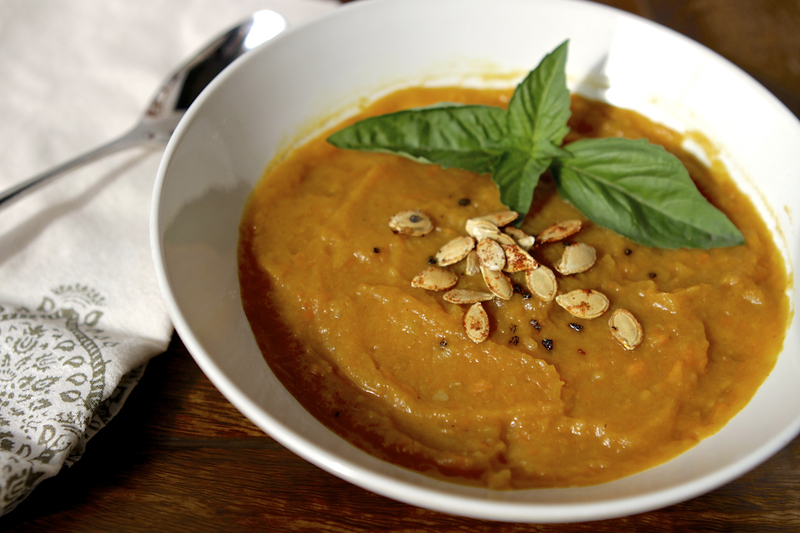 I used a butternut squash in this recipe, along with other autumnal vegetables and fruit. But feel free to substitute anything you have on hand. I didn’t have parsnips, but they would also be great. This recipe is based on “orange soup”, what we called a curried squash soup my mom used to make when we were young. cumin, curry powder, ginger powder, coriander, garam masala, etc. Preheat oven to 400-425° F. Prep the vegetables: cut the butternut squash in half and scoop out the seeds. Reserve the seeds for toasting. Roughly chop the carrots and onion. Cut and core the apple. Skins can be left on everything. Leave the yam or sweet potato whole. Don’t peel the garlic. When cool enough to handle, peel the skins off and transfer to a large pot. Add the quart of stock or broth, plus any water as needed to cover the vegetables. Bring up to a boil and then down to a simmer. Add the salt, pepper and spices to taste. Simmer for 25-30 minutes, or until all the vegetables are very soft. Using a stick blender, puree until somewhat smooth. Serving suggestions: Top with coconut yogurt or something else creamy. Sprinkle on the toasted squash seeds. I paired the soup with toast spread with avocado. A green salad would also be nice. Pumpkin seeds are the most famous squash seeds for toasting. Perhaps because pumpkins are so big the yield is “worth it.” But really any squash’s seeds can be toasted and eaten. We found the butternut squash seeds to be delicious! Preheat a toaster oven or an oven to 325-300° F. Since I was roasting the veggies at high heat I used the toaster oven for the seeds. My toaster oven is also easier to see into, which is important for keeping an eye on the seeds. Separate the seeds from the strings and flesh. Let them sit in a bowl of warm water for a few minutes to help rinse them off. Dry with a clean dish towel. 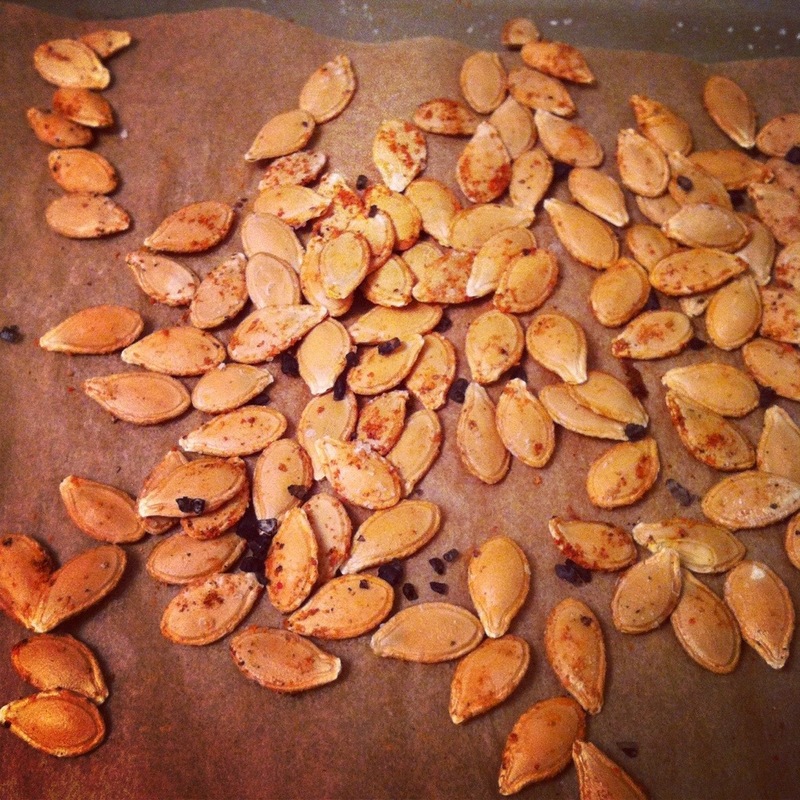 Spread the seeds on a baking tray lined with parchment paper. Sprinkle with a good amount of salt. I also used cayenne and black pepper. The seeds will be done when they are done. Sorry. It could be 5 minutes, or it could be 20. Check them and give them a stir periodically. The should be turning darker and getting crispy. Serve over the squash soup, salads or (our favorite) just snacked on! Line a baking sheet with parchment paper. Spread out the seeds and add salt, pepper and cayenne. Toast in the oven at 300-325 until golden. Perfect for a chilly day!